The only thing that appears to be constant in our lives is change. Our youngest son just began walking, he and the next youngest have moved into the same room, Brianna and I cleaned out our master closet, moved a dresser into said closet to further our organization effort, our oldest started Kindergarten, and Brianna had a career change that sees her working from home periodically. Realizing that we have no good place to work (much less concentrate) amidst the chaos of our family of six, creativity was forced upon us. We’ve always lacked an office space in our home (and with 6 people, we have no free rooms! ), so our ability to set aside such a space has been significantly limited. Moving Keaton in with Cooper freed up a nice little corner of our master bedroom. 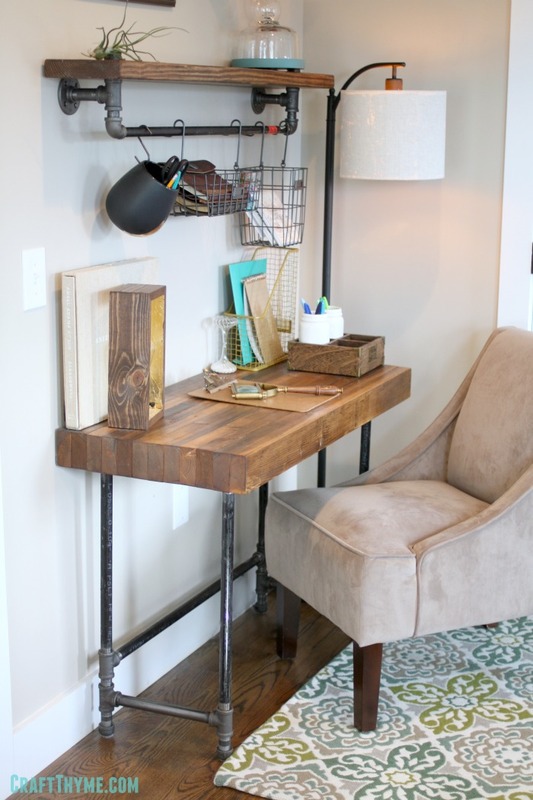 We’d looked at buying an industrial desk for our space, but we couldn’t find that perfect piece. Everything we’d looked at was either the wrong size or the wrong price. So, as typical, we decided to build something of our own! 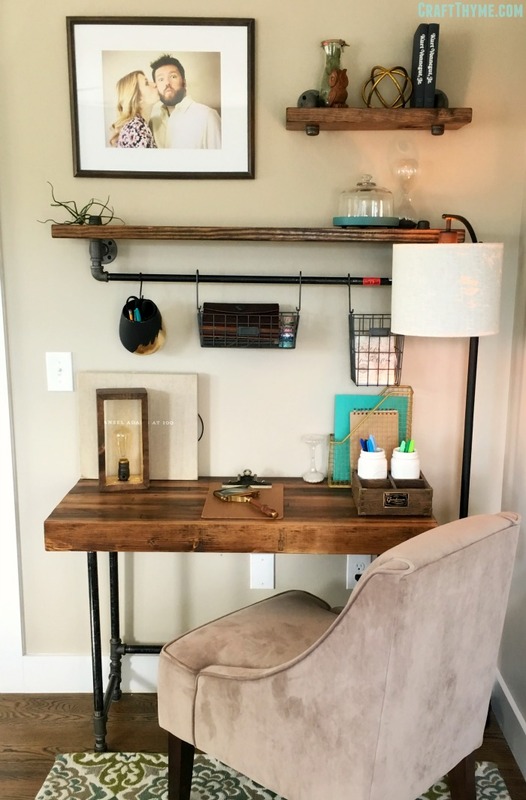 Brianna and I measured our available space, and after drawing out a few different options, our plan was to build an industrial desk that was 18″ D x 40″ W x 30″ H that matched the general décor of our home. Follow along below to see how we got there and let us know how we did! 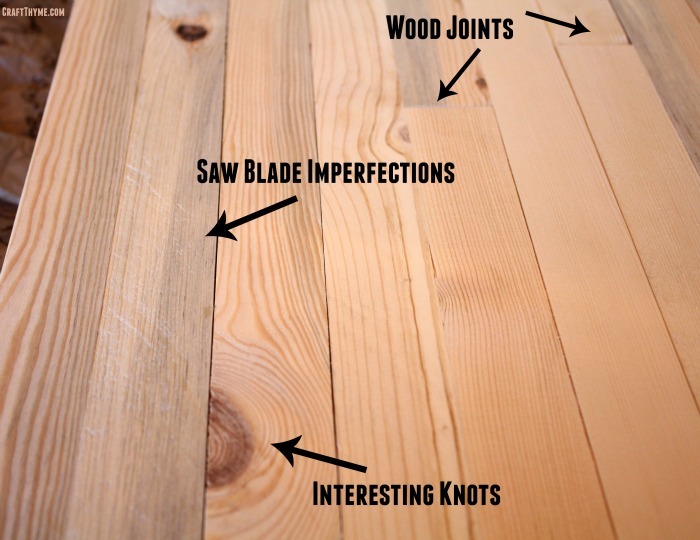 As always, pick out lumber that speaks to you. On the random Tuesday that I took off of work to focus on this build, the hardware store had some great, partially grayed untreated lumber. (Stress the on the untreated) Selection of colorful, knotted, and straight wood was easy. 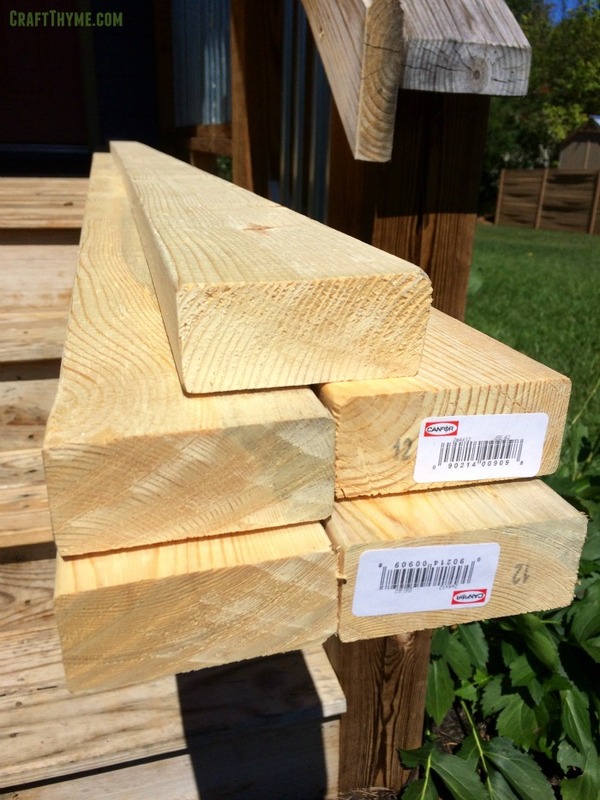 On to the lumber prep…. Given that the actual dimension of a 2″ x 4″ is 1.5″ x 3.5″, the easiest way to get to 18″ was to stack 12 2×4’s together (18 / 1.5 = 12). Super easy! 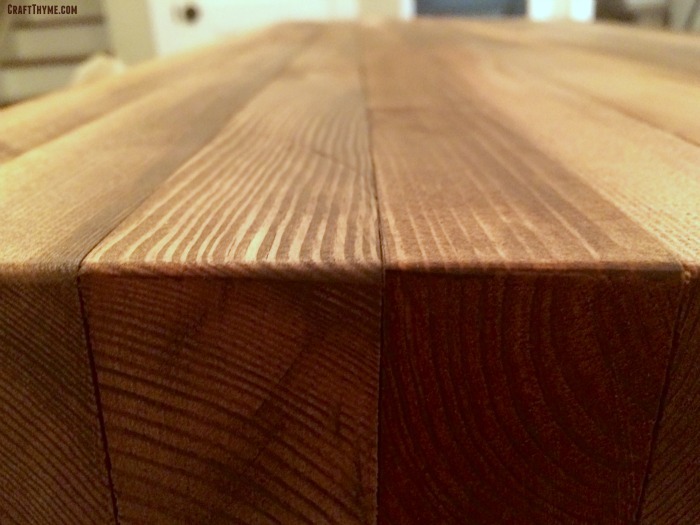 To get to 40″ wide, all we had to do was cut 40″ sections out of our lumber. If you’ve done the math, you’ll see that I have waaaaay more lumber than I needed for this project. Why have have 600″ when all I really need is 480″? I do this for two reasons: 1) I want to be able to use the most interesting sections of the lumber, and 2) I’m probably going to mess something up at some point. There are multiple ways to handle your cuts. You can cut all 40″ sections and call it good, or you can strategically cut random length sections whose total lengths equal 40″. I chose the latter. With this, I don’t have a true final cut list for you, constant reader. Make it random and make it awesome. But we didn’t stop there… oh no, that would be too easy. While stacking 2×4’s together gave us the right depth dimension, there were two readily apparent design flaws: 1) 2×4’s aren’t square, they’re rounded squares; and 2) the thing was going to be really freaking heavy. To remedy, we broke out the table saw and ripped both sides of the previously cut 2×4’s to make everything nice and square. We ended up taking off around 1/4″ from each side. The end result was nice, square lumber that weighed an average of 7% less. 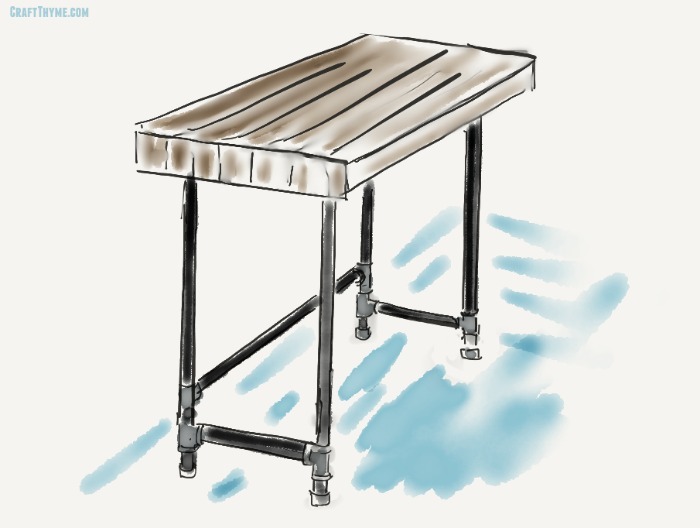 Having drawn out the basic design for our industrial desk’s frame (using Pencil*), we already had an idea of how we wanted to put things together. At that point, it was off to Lowe’s! Remember, your local big-box home improvement store will cut and thread pipe for you – most of the time for free! 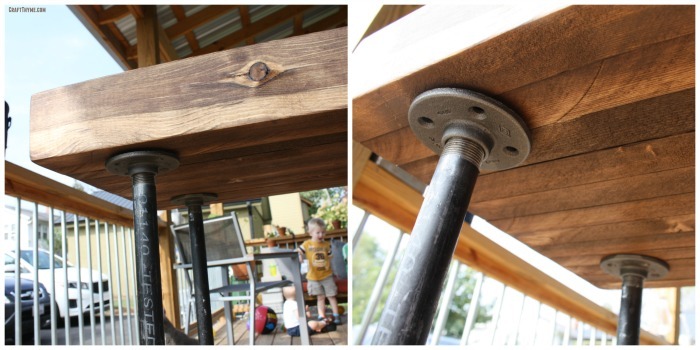 Hands down, the easiest part of this project is the desk frame assembly. 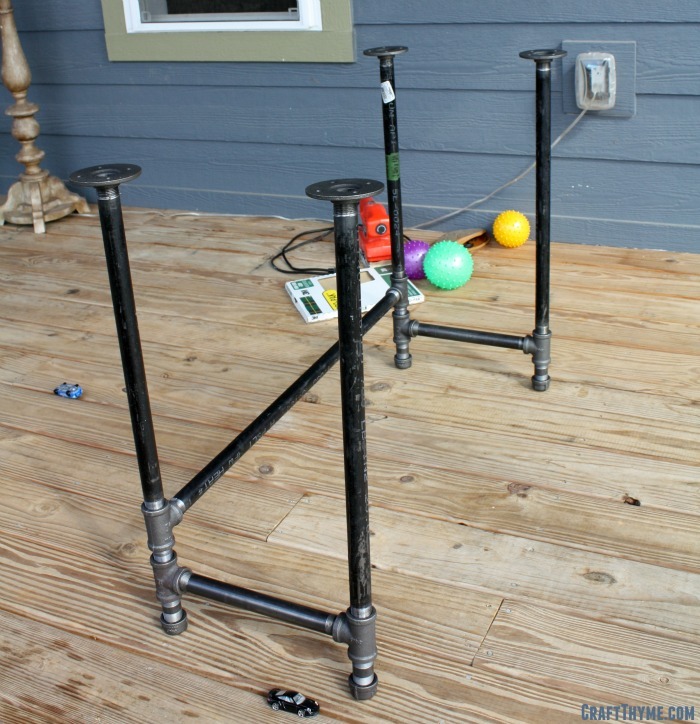 In a nice, open area, lay all of your pipe parts out and start putting things together as you’d planned. There’s no right or wrong order in this step. Give everything a good hand tightening as you get the pieces in their final position. Once you secure the frame to the desktop, everything will be stationary, so there’s no need to use any tools to aid you in this step. If you’ve got a long enough level, go ahead and check your frame at this step in the process. Yes, you can always make adjustments later if necessary, but it is easiest at this point. This step takes both time, and patience (frankly, personality traits I typically lack)…. 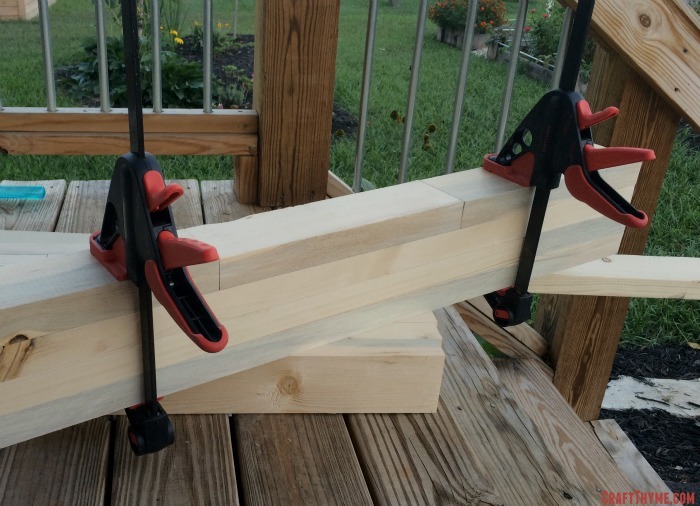 Using large clamps and as flat of a surface you can find, lay out 2-3 pieces of your previously cut lumber in the order you’d like them glues together. 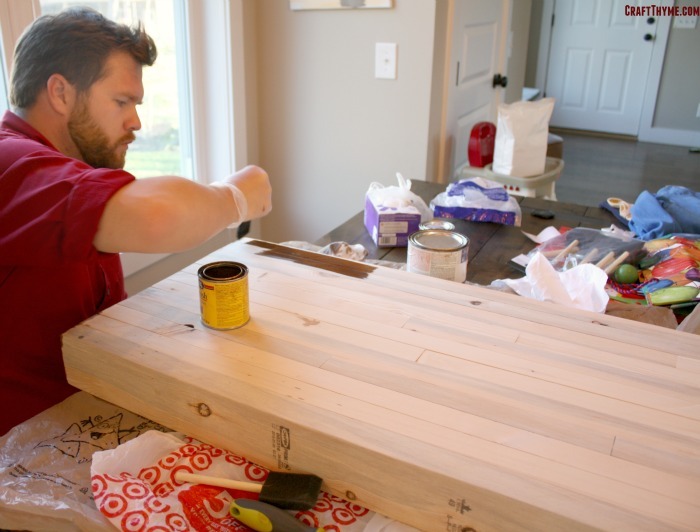 Liberally apply wood glue to the back of your face board (I am a big fan of the squiggle application method), but it up against the second piece of lumber in the series, and clamp that baby together as hard as you can. For best results, clamp both on the ends AND in the middle. Repeat this steps as many times as you have clamps on hand. 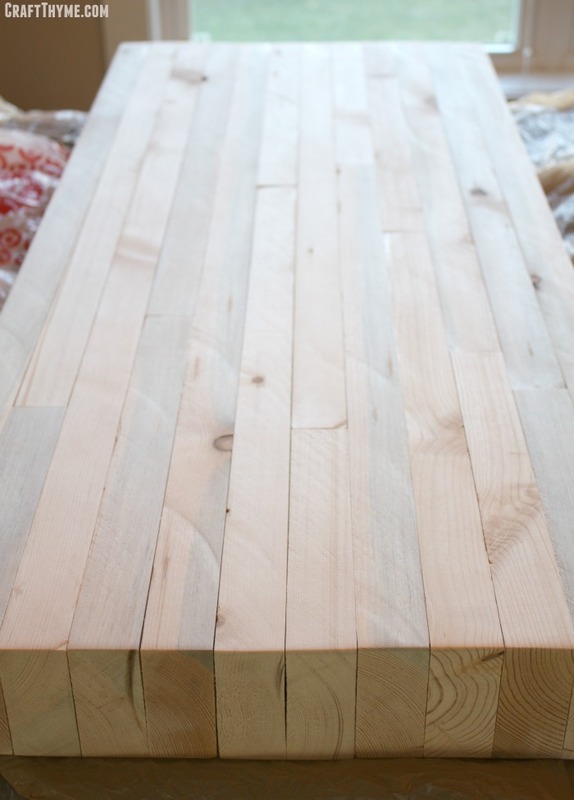 Most wood glues actually have a drying time of only one hour. So while this process takes patience, you can probably knock it out over the span of the afternoon. 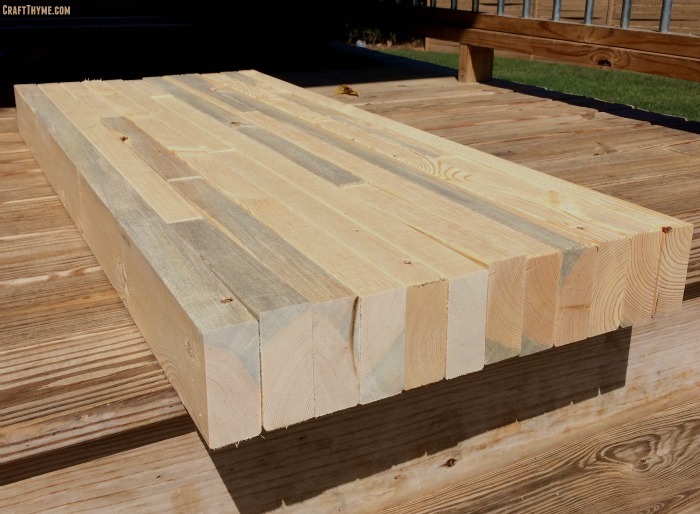 Once your newly glued sections have set for their hour, continue this process for your remaining pieces of lumber. When you have 6 stacks of two, start gluing those together. And so on, and so on. Depending on the size of the clamps you have, the last step of combining two stacks of 6 may be difficult (or frankly impossible). I had this problem, and for me, this spawned creativity. I went under the house and pulled out my crank straps. You know, the ones you use to tie a king-sized bed to an SUV that’s as wide as a full-sized bed? Believe it or not, these types of tie-downs make excellent large application clamps. Do your final gluing, wait an hour, and drink a beer as most of the hard work is complete. There are multiple ways to achieve that perfectly milled work surface. The BEST way is to use a mechanical planer to do the job for you. Unfortunately, we don’t own one of these bad boys. So… we did what we could the old-fashioned way and used multiple grits of sandpaper to knock down edges quickly. As you’ll see below, there are lots of wood joints, knots, and saw blade “imperfections” that would make writing on this newly made solid surface rather difficult. Hitting the desk top with heavy-grit sandpaper on the powered hand-sander will take care of any significant surface changes. When finished with the high-grit, move to medium-grit across the whole surface, and finish it off with a fine-grit. 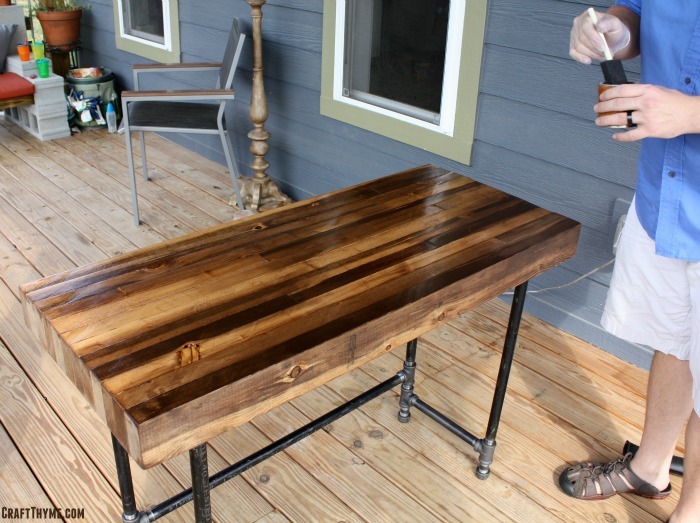 Choose your favorite stain(s) and desired polyurethane and get to work. For this project, we alternated the use of Minwax Early American with Rustoleum Dark Walnut. “Color blocking” best describes my technique on this particular piece: A block of one color here, a block of the other color there. Randomize the application of the stains (if you’re using more than one), wipe away, and see how it’s turning out. You can always make areas darker if need be by allowing for longer set-times or applying a darker stain over a lighter area. 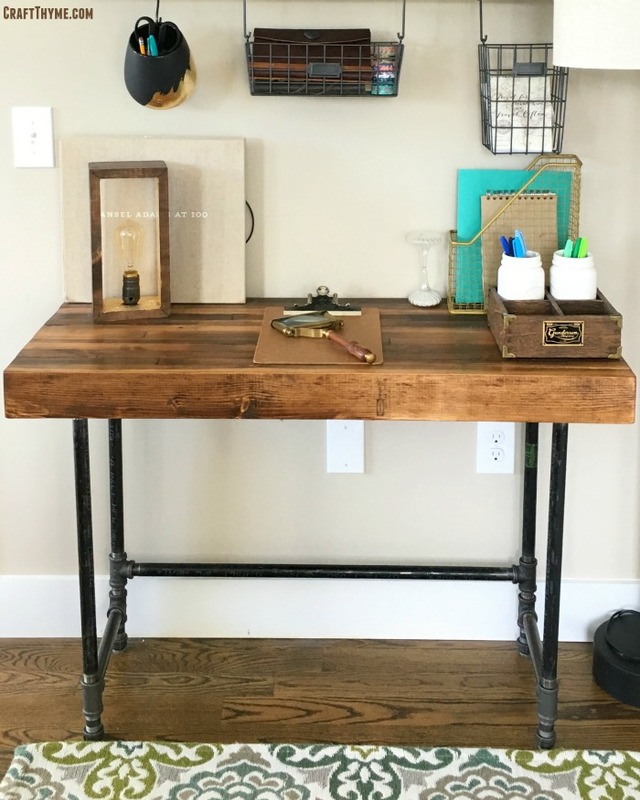 I’ll admit, once the stain had been applied and had dried, I couldn’t wait to see how the industrial desk looked on the frame. So… rather than apply the coat of poly on my nice grocery-bag covered work space, I hauled it outside and set it on the frame to get a sneak peek of what the final product might look like. Being happy with the progress we’d made, I decided just to keep the desktop sitting on the frame in order to apply a coat of Minwax Semigloss Polyurethane. I also went ahead and used some bronze colored wood screws to mount the desktop to the frame. One coat of poly was enough for this project. Let things dry as per the provided instructions.